Coastal flooding. Sea level rise. Drought. The Obama administration says it wants to help communities better prepare for climate change effects like these by using scientific data, technology, and technical know-how from the public and private sectors. Esri is joining Microsoft and several other tech companies to provide technology and expertise for the White House’s Climate Data Initiative. “The notion is to create and share knowledge to make communities more resilient,” said Esri president Jack Dangermond. Sponsoring the Esri Climate Resilience App Challenge, with prizes that were awarded in June for the top three applications developed with Esri technology that focus on solutions to climate-related issues. Esri hosts free maps and apps through its new climate-focused geocollaboration portal. 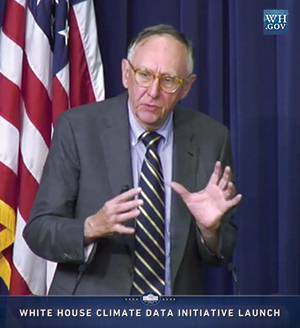 During the launch of the Climate Data Initiative at the White House in March, Dangermond said many local government agencies and other organizations already use the company’s GIS technology for planning, engineering, and disaster response. “What we are doing is engaging with different federal organizations to read climate information directly from NOAA and USGS as services that can empower all these state, local, and private sector organizations with tools that can bring climate change information to life,” Dangermond said. The geocollaboration portal that Esri hosts in ArcGIS Online contains maps and apps organized into sections, including disaster resilience, climate resilience, economic resilience, public safety resilience, and transportation and infrastructure resilience. Data in the maps comes from NOAA, the Federal Emergency Management Agency, the US Forest Service, and many other government agencies. For more information about the Climate Data Initiative and president Barack Obama’s Climate Action Plan, read the White House blog. A fact sheet from the White House outlines the commitments for the initiative by the government and Esri and other companies. For more information about Esri’s role, read Dangermond’s blog post “Supporting the White House Climate Data Initiative” on Esri Insider.